Saturday was gray, damp, and cool. It had rained the day before, and the leaves mulching the forest floor still held water in their cupped bodies. I was on an aimless walk in the woods, walking one way to check on the level of water in the stream, cutting back to look for oyster mushrooms on an old maple. As I made my way over to a small cluster of cedars, a piece of birch bark presented itself to me. And I decided: I’m going to make a fire. I’ve never started a fire before. Let me qualify that. I’ve never started a fire outside, by myself, before. Whenever I’ve been camping or backpacking or otherwise hanging out outside, there has always been at least one other person with me who has more confidence/experience/desire to be on fire duty. The closest I’ve gotten was last month at the Wildwood Path, when we completed a “one match challenge” to light a fire and boil a small amount of water. But this was done in groups, and we discussed materials, built a collaborative pyramid, and ultimately all three of us used pieces of flaming birch bark to light our tinder bundle. I started with the birch bark. Its oil kept it from being soaked, but it was a bit damp. I stripped some cedar bark from a downed tree: also not totally dry. 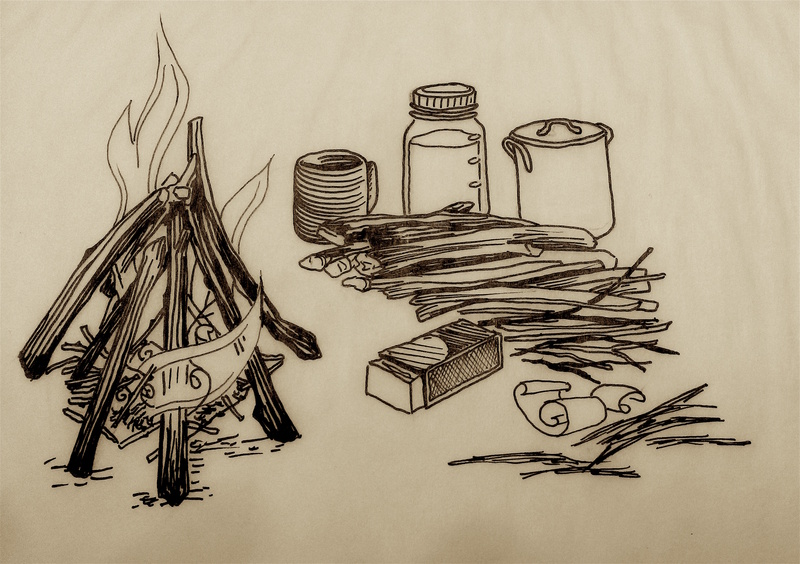 I put these precious finds inside my clothes, next to my skin, to warm and dry as I gathered kindling. The woods around my house are mostly young hardwoods. At this time of year, there is no protective canopy to shelter the ground from rain, so most of the kindling that I gathered from brush piles was damp. I had decided that I was only going to use one match, so I wanted to be really selective with my materials before attempting to light a fire, and I was not feeling confident that my tinder would burn long enough to dry these twigs. So I made my way to one of the few pine trees in the neighborhood, which shelters a collection of dead, dry branches under the full, live boughs overhead. They made sharp and reassuring cracking noises as I snapped them off and broke them into smaller pieces. I also snipped a cluster of pine needles. This fire was going to serve a purpose: boiling water for tea. Building a pyramid of kindling seemed more difficult than it should have been. Next time a fire is made in my presence, I’ll pay closer attention to this part. In the center of my pyramid, I made a nest of small, dry twigs, birch bark, and rubbed cedar bark. I used my match to light a piece of birch bark, which I pushed into the center of the tinder nest. And it burned! I quickly fed it with more pine twigs, giving the more damp twigs time to dry above the flames. As the fire took, the thoughts that went through my mind were: It worked! Am I going to get in trouble? Am I allowed to do this? Will my neighbors see or smell the smoke and worry? I felt like a kid playing in the woods and pushing the limits of what I dared to do.